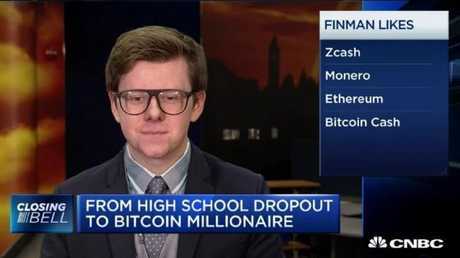 Teenager Erik Finman who made it big in bitcoin says if you’re not a millionaire in 10 years, it’s your own fault. AT AGE 15, Erik Finman begged his parents to let him drop out of the high school. His parents were highly educated and concerned by his desire to shun school so he made a bet with them: If he could become a millionaire by the age of 18, he didn't have to go to university. He is now 19, a budding tech prodigy and at least on paper, a millionaire. In fact it was so easy he says if you're not a millionaire in the next 10 years, it's your own fault. You're doing it wrong. 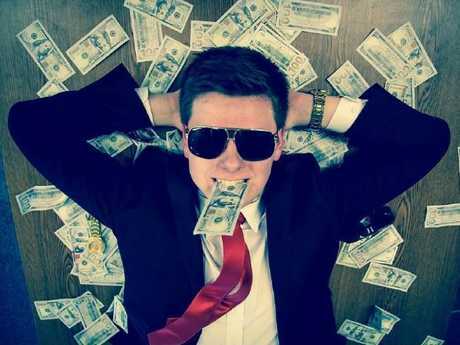 His road to premature riches all started when he was 12 years old and his grandmother gave him $1000 as a gift. 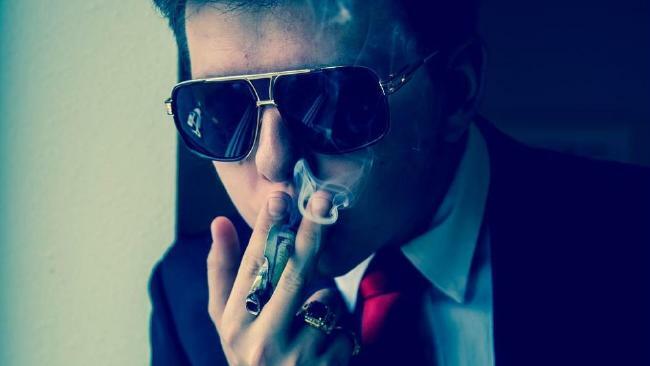 He decided to invest it in the then emerging cryptocurrency bitcoin and bought 100 units of the digital currency after his older brother told him all about it. 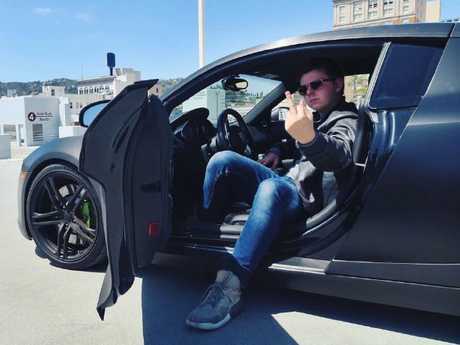 He took to the currency with such gusto that after he started making headlines by the age of 16, some in the media anointed him "Bitcoin Boy". Speaking to Business Insider he said people can easily do the same as him in the coming years. "If you are smart about cryptocurrency over the next 10 years, many people can build their fortunes even better than before," he said. "The area is still relatively small - the market capitalisation is just over half a trillion dollars. I do not want to be misunderstood - this is, of course, a very high amount, but in comparison to other asset classes, it's small. Therefore, I say if you do not become a millionaire in the next 10 years, then it's your own fault." The successful teen has an acute sense of satire. It hasn't been a good month for bitcoin and much of the cryptocurrency market for that matter. While wild fluctuations in price are common, bitcoin is down more than 50 per cent from its December high when media saturation seemed to peak. With the threat of further regulatory crackdown by governments and questions over its viability as a method of payment, it shows little sign of surging upwards any time soon. After reaching nearly $US20,000 in December, this morning bitcoin dropped below $US9000 per unit. Erik Finman may have accumulated a small fortune in the cryptocurrency market and thinks others can do the same but with hundreds of new digital coins continually coming out, there are plenty of scams, fads and ways to lose your money. You might be wise to take heed of another piece of advice dispensed by the teenager: "The easiest way to make money is to create something that solves a problem, or improves a situation. Don't chase fads, chase opportunity," he wrote on Twitter last year. For a majority of investors looking at so-called alt-coins, the difference between fad and opportunity is almost impossible to discern. “I can proudly say I made it, and I’m not going to college,” he told CNBC. For a kid who largely grew up in a small town in the US state of Idaho, chasing opportunity is certainly something Erik Finman has done. At age 15 he claimed to have 20 people working for him at a company called Botangle which built and operated an online video-chat tutoring platform which connected eager students with teachers. He once had a meeting with a top executive at Uber to discuss the company but was later offered $100,000 for it. Instead he accepted 300 bitcoin to sell the company. After reading Reddit co-founder Alexis Ohanian's biography, he cashed in some of his cryptocurrency fortune to buy a dinner and basketball game with the social media mogul at a charity auction. Around the same time, in 2014, he was named one of Time magazine's most influential teenagers and has since gone on to work in Silicon Valley to continue his stated desire to "fix education". Among other things, he is currently working to build a satellite that will serve as a time capsule, inspired by astronomer Carl Sagan's famed Golden Record. Dubbed Project Da Vinci, the experiment is being overseen by NASA, and pop icon Taylor Swift has even contributed a signed copy of her album 1989 specifically for the satellite project. Another classic Instagram post by the teenager. Despite the recent downturn in the crypto market, the Bitcoin Boy still very much believes in cryptocurrencies. "I still believe in cryptocurrencies. There are always ups and downs on the way up. Many people have anticipated this decline. It was almost a self-fulfilling prophecy after many experts spoke of a bubble," he told Business Insider. "I remain stuck with my bitcoins - and there are a lot of them." However much like Netscape gave way to Internet Explorer and MySpace gave way to Facebook, he thinks bitcoin is likely to suffer a similar fate. The first one through the wall always gets the bloodiest, as they say. And there's no shortage of people predicting an eventual bitcoin bloodbath. "The technology is already beginning to be obsolete - to buy a coffee for $2, you have to pay a transaction fee of $30," Mr Finman said. "Fact is, bitcoin as we know it today will not last forever. The only question is what comes next - either an update that solves the problem, or another coin will prevail."